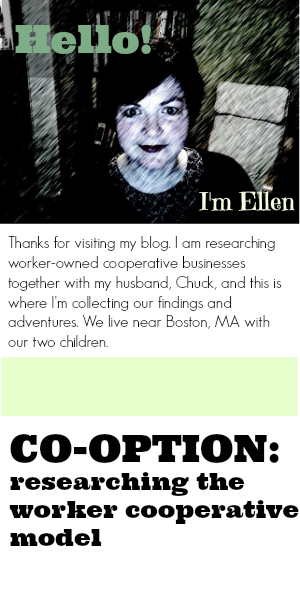 I have been researching the cooperative model for a possible business in my town. Cooperatives are democratic organizations controlled by their members. You might wonder, if there is no "boss" running the business, if it is run by a group of people, how are decisions made? It turns out that most coops make decisions by consensus, or some form of it. Consensus means reaching general agreement. Consensus works well if certain conditions are met. The group needs to share a very clear mission and purpose, and be willing to interact on a deep and personal level, and spend the time necessary to do that. This is of course easier if the group is not overly large, and has some requirements for membership. When our church started, the By Laws required consensus, but that was changed early on. Not only was the group too large, but virtually anyone can become a member, so there is not the necessary sharing of values, etc. It just does not work in that situation! My dad, Geoff Stone, said that one should look for these characteristics when seeking members: like-minded people with a collaborative nature who have the needed skills. It is necessary to have a very clear process for dealing with a "block". (A block is when a single member or small group stands in the way of where the others feel strongly the organization should go.) It must be determined whether it is a "valid" block or not. Usually, a block must be based on the belief that a proposal is in opposition to the mission and values of the group, and/or will be harmful to it. People are not supposed to block just because they don't like something. They can "stand aside" if they want, but not block. Keep the mission and purpose as narrow as possible. This is what will be referred back to when testing the validity of a BLOCK. The fuzzier the mission and purpose, the more prone to interpretation and disharmony. Why not go with a majority vote instead, like we do for our government elections? Sue: With majority voting, you can have the "disgruntled minority", and this is not healthy either. So a system that works toward consensus but has some sort of "relief valve" seems to be a good middle ground. I understand that most communities now, ours included, are switching from "pure" consensus (meaning everyone has to agree) to some adjusted form of it. For instance, we have agreed that 85% of people present at a meeting must agree that a block is invalid before it can be overrided. If it is valid, the blocker must meet with the proponents of the proposal to try to work out their differences. After that, we have "consensus minus one" - a proposal can pass with one person blocking. Some communities have a similar process, but with a fall-back of voting, such as a 75% majority. There is also a process called Sociocracy, which is similar to consensus, but some people feel is an improvement. We are using some aspects of it. Diana Leafe Christian is an Earthaven member and author who facilitates workshops on decision-making methods for communities. She no longer advises pure consensus. Here is an article she wrote in 2012 for Communities Magazine in which she suggests three alternative revisions. The problem that we found with consensus is that it can become a "tyranny of the minority". Essentially, one person can stop everyone else from doing what they want to do. This causes conflict, frustration and resentment. Inevitably, there will be people who will be difficult, will block for personal reasons, just don't understand the reasoning, are on a power trip, or whatever. Of course, things go better in a group if the decisions that are reached are supported by everyone. What percentage of the time would you say that Earthaven members are able to come to a decision on which everyone agrees? Sue: I would say that probably 90% of the time we eventually come to agreement. And not every time we don't is the result of a block. Sometimes it just appears that enough people are against a proposal that it either needs to be reworked or just dropped. Geoff: I'm recalling only three blocks in our 15 year history. Two were declared "not valid". One was on accepting a new member. According to the consensus experts a block is very serious and a group of like minded people should be able to work through issues to come up with a solution that meets everyone's needs. With a mature membership one should only expect to use a block once in a lifetime. Sometimes the threat of a block causes an idea to be dropped...not fully explored. We encourage our members to avoid the "b" word except when consensus is called for. A collaborative person would use phrases like "I have a concern about the proposal as it has been presented. I'd like help in modifying it to....."
What are the benefits of making decisions this way? Sue: The benefits are that everyone is in agreement with the decision, so no one will be trying to sabotage it or will hold a grudge against the rest of the community. Everyone will be cooperating in carrying it out. Geoff: Theoretically this process allows everyone to be heard and solutions have the total support of the membership. The down side is that it frequently takes a lot of processing (time) to work through the process. What are some of the more divisive issues Earthaven members have discussed, just out of curiosity? Agricultural issues! How to clear land and how it is to be used. Riparian zones along rivers. The grazing of animals. And pets! Thanks to my parents, Sue and Geoff Stone, members of Earthaven Ecovillage in North Carolina, for sharing their experience with decision-making by consensus. UPDATE from Earthaven - On January 26, 2014 the members of Earthaven approved a proposal that calls for a last resort vote (61.8% - which is Phi, or the Golden Mean) on proposals if we cannot reach consensus. We previously approved a proposal of "consensus minus one", which actually has never been tested, but there was a desire to have a larger fallback option. Many communities are discovering that "pure consensus" causes frustration, dissatisfaction and discouragement, and are moving toward this adjustment. It doesn't mean that we won't try to reach consensus, but that, if we can't, we still have a way to move forward.